Layer Marney Outdoors open for 2019 bookings! This is a great chance to speak to Essex Community Foundation about a project / programme you are interested in running! Our Phone-In Funding Surgery for charities and community organisations working in the Braintree District is TODAY from 10am to 12 noon. Call us on 01245 356018 to tell us about your work and discuss funding opportunities. The office is manned from 9am-5pm, Monday to Friday. 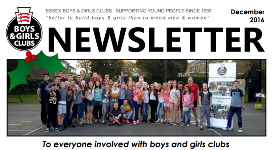 We are proud to be affiliated as full members of the National Association of Boys and Girls Clubs and to the Essex Council for Voluntary Youth Services.